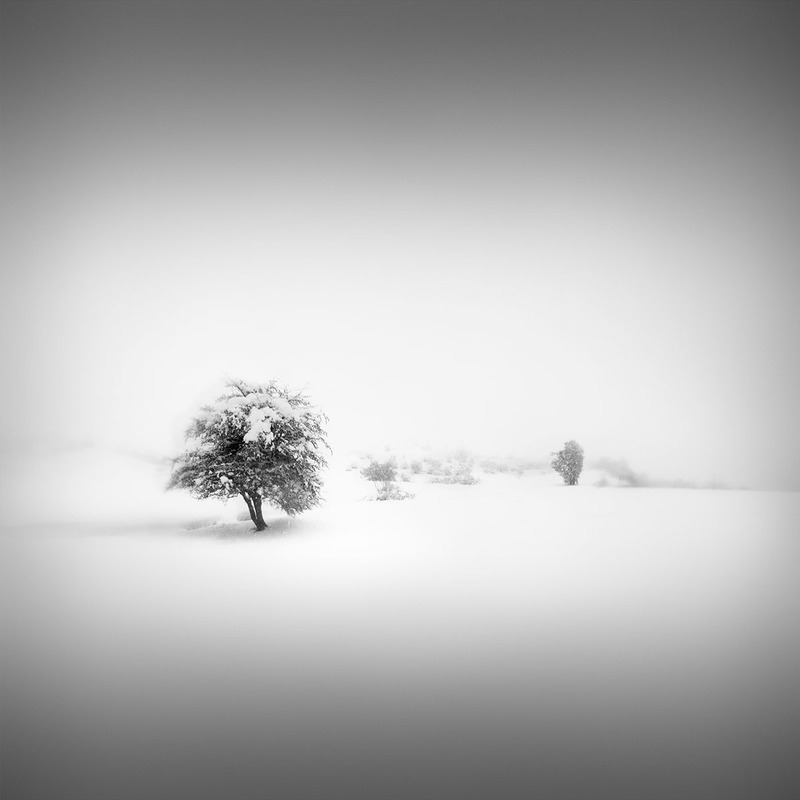 Another lone tree in my winterscape series Catharsis. This project started two years ago. I wanted to photograph this place under snow for the last two winters, but as you probably know, I live in Greece and we do have a lot of sun and warm weather, but snow is a rarity. Plus, this place is quite far away from my home (some 450km to be exact) so it’s not too easy to get there, meaning that I was relying quite a lot on luck, which I finally had this winter. Everything I shot in this series has been shot in not more than a couple of hours and I still have a lot of images, even very different than the one in this series that I either processed or I will process because I like them all. I have also done some experiments with ICM (intentional camera movement), some very minimal images but surreal and quite hunting, and they will probably become an independent series and I also have some other shots with larger subjects. What I want to say with this is that sometimes the conditions are so perfect: weather, place, inspiration, moment, luck that almost every click you make can result in a finished image. It’s quite rare for all these to come together and create such a perfect moment, but this day was one of those moments. These two or three hours that I was there shooting trees were some of the most intense and rewarding in my photographic life. And I could say that this series reflects somehow the course of my recent life and it helped me to find answers to a lot of questions that I had in a process of “finding myself” artistically and individually. As I have already said I consider art as a very personal issue, as something you do because you deeply need it, as a tool in interpreting life and the world around us and I don’t believe in any other message than the personal one as far as real art is concerned. The idea behind the conception of the images in this series, what I was aiming for was to find a way of showing how solitude in front of the immensity of nature is able to help one get in touch with the inner self that we often ignore and suppress in the frenzy of the day-to-day life, when we are living more for others than for our own selves. The lone tree in my images is not a lonely tree, it’s just a tree that is facing itself and is having a long and in-depth conversation with his own conscience. The different images represent different questions that this tree has to answer in order for it to do the “κάθαρσις”, to go through this process of purification of the soul and mind. The conclusion of this conversation (or of this monologue, if you want) will come with my next image, with the last lone tree of the series. The aim was to keep the lone tree sharp enough to be able to play the leading role and tell its story. At the same time I needed the rest of the trees to be visible but not too evident, somehow like playing supporting roles in this play and as characters that help define the leading “actor” but don’t have too much definition themselves. The weather conditions helped a lot with it. The rather heavy snowfall and the wind that made the snow move quickly in the air, with the result of it not being too visible in the shot, was creating a sort of mist that made everything that was not in the foreground seem very far away and vague. I took advantage of this natural mist and used it as a base, emphasizing the effect by reducing contrast and clarity in Lightroom by using adjusting brush, in the background trees and the other landscape elements, dodging also some areas that were too dark and intense, in Photoshop by using the dodge tool and Silver Efex Pro2 (control points). On the other side I boosted the contrast and clarity for the main subject, also changing the distribution of light so I can emphasize more its shape and the bright snow it carries (dodge, burn in Topaz BW Effects and control points in Silver Efex Pro2). The idea was to create a contrast but also a balance between the subject and its background, like a dialogue that is going on between the two. The tones that I worked with were generally bright tones. I’ll mention their distribution based on Ansel Adams’ zone system. Since some of you asked me what this system is, you can read more about it on http://www.luminous-landscape.com/tutorials/zone_system.shtml and soon you can expect a lot more material on this subject and many more (more details about this coming up soon). Most of the tones I used in this image belong to the zones 7-9 (65-70% of the image is in this area), with a touch of zone 10 next to the main subject, used to draw the attention to it, and the rest of the image covering the zones 3-6. Not many dark tones in this image, as the goal was to suggest the bright white light of a snowy winter day and the zen state towards which the tree was slowly moving. The dark tones in the zones 1-3 cover not more than 3-5% of the image and I used them close to the very bright area in zone 10 to create contrast and again draw the view to my subject. The gradient I added in the upper and lower side of the image is a simple linear gradient (used in normal mode) that I applied with very soft passes at 1% intensity, so to create a very smooth transition and to be able to control my light distribution across the image so I can lead the eye of the viewer to where I want it to go, on the tree that is, and to add depth in the scene. The gradient was applied on a separate layer, which was quite practical, because I was able to reuse this layer in all the images of the series, thus managing to keep a uniform look (which was my intention), Another choice I made, in order to be able to keep an uniform look, was to keep my horizon line at the same height more or less in all the images. This is in a few words what I had to do to bring this image from its raw form to where I envisioned it, creating my (en)Visionography™, or in another way, my way of calling inspiration + processing = creation, my way of calling my photography. More on this concept in Introducing (en)Visionography™ – Making of Ode to Black | Black Hope I – Self Black where I defined and elaborated on how I create it. Posted in Landscape Black and White Fine Art, Tutorials Fine Art Black and White Photography. RSS 2.0 feed.